This is Fiddler on the Roof, but not exactly as you may have seen it before. The national tour of Bartlett Sher’s most recent Broadway revival takes this time-honored classic and injects it with a fresh energy. It’s still the same show, essentially, but some staging changes and some especially strong performances highlight the strength of the material in a new and refreshing way, anchored by an especially strong leading performance and ensemble cast. As beloved as Fiddler on the Roof is, one of the challenges to staging it is that, for most professional productions, the staging has strictly adhered to the original Jerome Robbins staging and choreography. As excellent as that is, if you see enough productions of the show, it can all seem too similar after a while. The most recent revival, while still using the Robbins staging and choreography as the basis, brought in a new choreographer, Hofesh Schechter, to change up some of the dances, and acclaimed director Bartlett Sher has added a simple but effective framing device to add an element of timeless transcendence to the story. These elements, along with an energetic, well-chosen cast, have brought a sense of vibrancy to this show that is especially refreshing. The story is the same, following Jewish milkman Tevye (Yehezkel Lazarov) and his family in 1905 Tsarist Russia, but now, everything seems more immediate somehow. The relationships between Tevye and his wife, Golde (Maite Uzal) and his daughters, and between his three oldest daughers Tzeitel (Mel Weyn), Hodel (Ruthy Froch), and Chava (Natalie Powers) and their suitors Motel (Jesse Weil), Perchik (Ryne Nardecchia), and Fyedka (Joshua Logan Alexander) seem even more authentic and credible. From classic solo moments like “If I Were a Rich Man” to big production numbers like “To Life”, “Tevye’s Dream”, and especially the entire wedding sequence, the energy is readily apparent, with new relationship dynamics subtly suggested, and with a great deal of energy and heart. Even the poignant ending is given a new sense of timelessness and hope without denying the inherent sadness of the situation. There’s a great cast here, as well, led by the dynamic, charismatic performance of Lazarov as Tevye. With a strong voice and excellent stage presence, Lazarov brings all the energy, charm, likability and complexity of Tevye to the stage, leading the cast with a powerful performance. He’s well supported by a strong ensemble, as well, with standout performances from Uzal as Golde, Carol Beaugard as the determined matchmaker Yente, Jonathan Von Mering as the lonely butcher Lazar Wolf, and especially all three daughter-suitor combinations, with Weyn and Weil having particularly excellent chemistry. There’s a strong singing and dancing ensemble supporting the leads, as well, bringing the village of Anatevka to life in one memorable scene after another, from the opening “Tradition” to the closing “Anatevka”. Technically, this production is stellar, as well. The set by Michael Yeargan is detailed and versatile, featuring well-realized settings like Tevye’s house against a more changeable background backed by an imposing brick wall. The costumes by Catherine Zuber are detailed and authentic, maintaining a classic Fiddler look with a few small changes here and there. There’s also truly stunning lighting by Donald Holder that sets and maintains the mood of the show especially well, along with excellent sound design by Scott Lehrer and Alexander Neumann. One of the real strengths of director Bartlett Sher in his revivals is that he’s able to maintain the essence and spirit of a show while also bringing a new sense of immediacy and connection for modern audiences. He’s done that again, remarkably well, in this new Fiddler on the Roof. It’s still the same show, but there’s something extra there that’s especially rewarding. It’s on stage at the Fox now. Go see it if you can. The Muny’s 100th season is finally here, and it’s opening in grand style with a show that’s really several shows in one. The 1989 Tony Winner for Best Musical, Jerome Robbins’ Broadway pays tribute to a prolific director-choreographer from the Golden Age of Broadway in a production that, even though it has “Broadway” in the title, seems almost tailor-made for the Muny. The Muny has traditionally been about big, large-cast musicals with spectacle and style, and that’s here in abundance with Jerome Robbins’ Broadway. It’s the first regional production of the show ever, apparently, and although it’s not exactly the same as the 1989 version, most of the songs are here, highlighting Robbins’ illustrious career and featuring some iconic numbers from classic shows, as well as some numbers from lesser-known shows. From On the Town, HIgh Button Shoes and Billion Dollar Baby to West Side Story, The King and I, Peter Pan, and Fiddler On the Roof, this show has a little bit of everything, dance-wise, from dramatic, ballet-influenced numbers, to jazz, to slapstick comedy, and more, staged with the usual big, bold, high-energy stage-filling style of the Muny. There isn’t really a story here. It’s a revue, essentially, with Rob McClure as “The Setter” introducing the scenes. McClure, a Muny veteran and favorite performer, also plays several memorable roles in the production, including two roles from HIgh Button Shoes and the role of Tevye alongside Maggie Lakis as Golde in the excellent Fiddler sequence that features “Tradition”, “Tevye’s Dream”, “Sunrise, Sunset”, and the always thrilling wedding dance. There are many excellent moments here. In fact, there are so many highlights, it’s not easy to name them all. Among the standout routines is a thrilling rendition of “I’m Flying” from Peter Pan starring Sarah Marie Jenkins as a vibrant Peter Pan, along with Elizabeth Teeter as Wendy, Gabriel Cytron as Michael, and Cole Joyce as John. This sequence is particularly dazzling, with excellent flying effects by ZFX, Inc. and great use of the Muny’s electronic scenery wall. The ensemble is the star here, really, with energetic dancing from the more dramatic West Side Story moments to the high comedy of the “On a Sunday By the Sea” number from High Button Shoes. Another memorable sequence is the truly stunning dance number “Mr. Monotony” featuring powerful vocals from Muny veteran Jenny Powers and astounding dancing from Sean Rozanski, Alexa De Barr, and Garen Scribner, who also all turn in strong performances in the West Side Story sequence as Bernardo, Maria, and Tony respectively, alongside the equally excellent Davis Wayne as Riff and Tanairi Vazquez as Anita, along with an athletic, energetic ensemble of Jets and Sharks. There is so much here to see and enjoy, with Robbins’ routines recreated with an authentic look and feel, to the point where it seems for some moments as if the audience has traveled in time. The production values here are also first-rate, with a stylish, colorful and versatile set by Paige Hathaway and remarkably authentic costume design by Robin L. McGee. There’s also excellent lighting design from John Lasiter, lending atmosphere and changing tones and moods to the various production numbers. There’s also great video design by Nathan W. Scheuer and wonderful music from the always excellent Muny Orchestra. This is an old-school musical revue with lots of energy and a big cast to fill out the enormous Muny stage. Jerome Robbins’ Broadway is a collection of numbers that serves as an ideal first show for the Muny’s 100th season. It’s a retrospective, but also a celebration of musical theatre’s past as the Muny prepares to move into the future. It’s a dazzling start to a long-awaited season in Forest Park. The Muny is presenting Jerome Robbins’ Broadway in Forest Park until June 17, 2018. 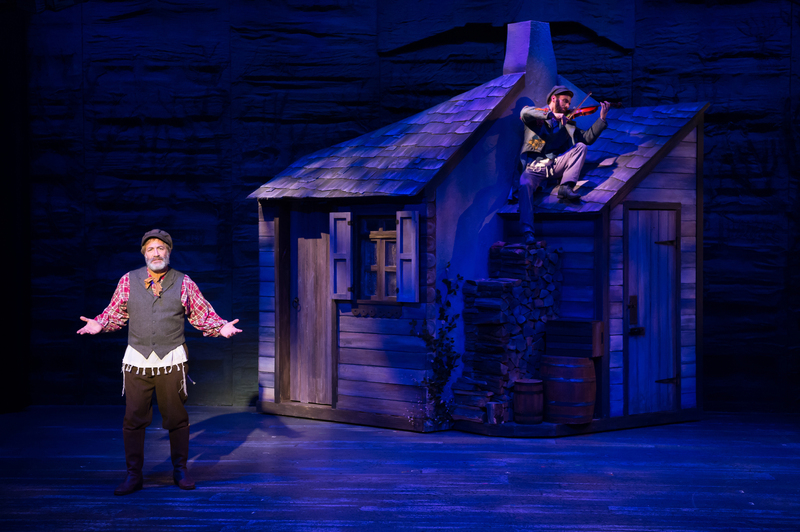 Fiddler on the Roof is a much-performed musical theatre classic. In fact, it’s been performed so many times at so many levels (amateur, regional, school, etc.) that it’s the one show I’ve seen the most productions of. And then there’s the film, which I’ve seen several times, and the Original Broadway Cast recording, which I grew up listening to. Seeing a show that many times is great if you like the show (and I do), but it’s also easy to get complacent and just think “oh, it’s Fiddler” and have to make an extra effort to pay attention during performances unless there’s something great or distinctive enough to make it stand out. Fortunately, the season closing production at Stages St. Louis is one of those presentations that makes watching an age-old much-seen favorite seem fresh and vibrant enough that I can easily watch it not out of effort or obligation, but out of sheer joy. The story of this show is well known, recounting the trials, tribulations and traditions of Tevye (Bruce Sabath), a poor Jewish milkman in a small village in Russia at the turn of the 20th Century. With political tensions rising in the world around his village, and with new customs and ideas gradually entering their previously isolated society, Tevye is forced to consider his own ways and the reasons behind them. The opening number “Tradition” sets the scene, although gradually and surely, things happen that make Tevye think about his own ideals and what it means to reconcile the old ways and the newer ways. Primarily, these changes are presented in the courtship stories of Tevye’s daughters. 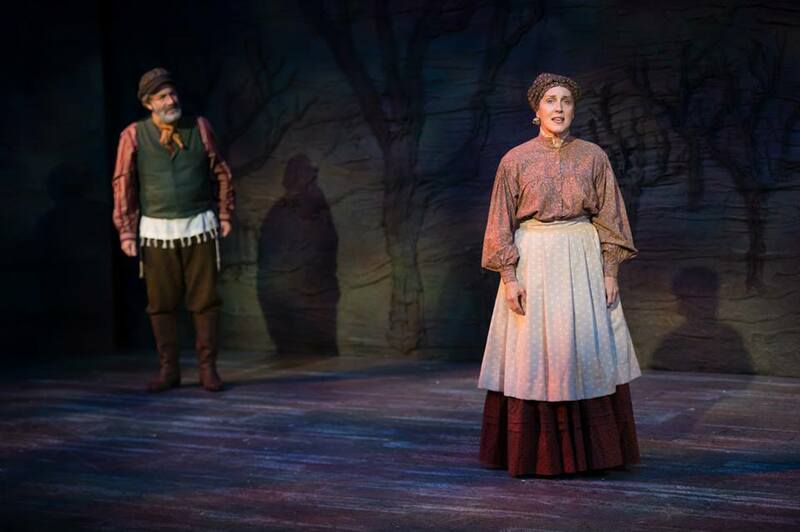 While Tevye and his wife Golde (Kari Ely) have five daughters, the three oldest are of marriageable age, and Yente the matchmaker (Rechel Coloff) is determined to find them husbands, although the daughters have their own ideas that are increasingly challenging to the old system. First there’s Tzeitel (Stephanie Lynne Mason), who would rather marry her childhood sweetheart Motel the tailor (Nick Orfanella) than the older, wealthy butcher Lazar Wolf (Christopher Limber). Mostly, the stories unfold one at a time, with daughters Hodel (Julie Hanson) and Chava (Carissa Massaro) presenting Tevye with their own, increasingly challenging choices of suitors, and while Tevye deals with what those marriages mean to his own life and his own relationships with his family, his village and his faith, the turmoil in the outside world and the tensions between the Jewish and non-Jewish villagers in his own town gradually simmer and threaten to ultimately boil over. This is a production that is full of life in all its aspects, portrayed with a great deal of energy and a degree of realism in the performances that sets it apart from some previous productions I’ve seen. I’ve noticed that with this show, there is a tendency among some of the actors to overplay their roles just a little bit, and sometimes a lot in the case of some characters, but it’s refreshing to see that nobody does that it this production. The characters are all very believable and not over-the-top, led by Sabath as a particularly charming, down-to-earth Tevye. With a strong stage presence, clear voice, and witty line delivery, his Tevye is a distinctly compassionate, thoughtful man, and his concern for his daughters is very relatable. He works very well with Ely as the dutiful, constantly concerned Golde, who also manages to bring an earthy realism to her role. They are a well-matched pair, bringing energy to their banter throughout the show and real warmth and heart to their sweet duet “Do You Love Me” in the second act. The daughters and their suitors are also very well-cast, especially Mason as the more practical older daughter, Tzeitel, and the lanky Orfanella as the earnest, sweetly awkward Motel. “Miracle of Miracles” is a delight, as is their wedding, which is also a standout moment for the entire cast. Especially in the after-wedding dancing–first the famous and still captivating “Bottle Dance”, and then the increasingly palpable joy and energy as the townspeople join in dancing together. For the first time in seeing this show, I felt like I was at a real wedding, and that’s wonderful. It also made the drama to follow all the more poignant. Other strong performances include those of Coloff as the gossipy Yente and Limber as the butcher Lazar Wolf. It’s a very strong ensemble, with great dancing all around, especially in the aforementioned wedding and in “To Life”. It’s a smaller ensemble than I’ve seen before in Fiddler, although for the most part, that only serves to make this production more accessible and less obviously “showy”, except for the opening “Tradition” number, which does seem a bit cluttered. The technical aspects of this show are top-notch, as well, starting with the richly detailed set by James Wolk that evokes the work of painter Marc Chagall–whose painting, “The Fiddler”, inspired the show’s title. The costumes by Lou Bird are also extremely detailed and appropriate, if possibly a little too “clean” looking for some characters (like the neighborhood beggar). With strong, atmospheric lighting by Matthew McCarthy and the vibrant Jerome Robbins choreography re-created by Gary John Larosa, this show is as appealing visually as it is dramatically. It’s all unmistakably Fiddler, but given an air of immediacy by director Michael Hamilton and this great cast, with a few new approaches to characterization and staging that give it a distinctive character that allows it to stand out from the crowd of previous productions of this show that I have seen. Fiddler on the Roof is a classic show that, when produced well, can be timeless as well as timely. Its themes of family, faith and tradition vs. change are both specific and universal, and it also provides a fascinating perspective on an earlier time and place in history. This production is to be especially commended for its vibrancy and approachability in addition to its excellent production values. It’s a fitting and memorable closer to Stages’s excellent 2014 season.